You can build an accurate spindle speed sensor for less than $10. Mach3 uses a single pulse per revolution to determine speed and index for threading - this works but doesn't deal well with fluctuations in rpm (inevitable), meaning threads may not be as clean as possible. LinuxCNC uses a spindle index (one pulse per revolution) and a spindle phase A (many pulses per revolution - I used 60). For this you need two sensors. Fortunately two optical sensors can be bought very cheaply from ebay (search for "slotted optical switch"). You can also use a quadrature encoder which uses two phases as well as an index. It cost me US$5.88 (including shipping) for two optical sensors on PCBs with a voltage input of 3.3-12V. The main PCB has a power LED (red) and a green LED for each sensor that indicate the state - making it easy to see when it's working. My version has two trimpots that adjust the sensitivity. I removed all the change gear hardware and used bent sheet metal as mounts for the sensors, bolted to existing holes. I made slots in the sheet metal so I can adjust the exact position of the sensor to get it sensing right. 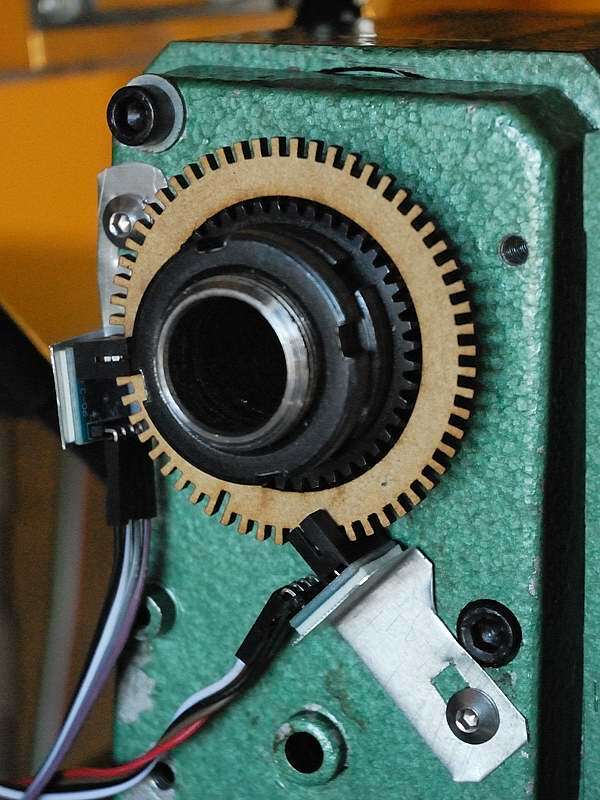 For those new to LinuxCNC it may be easiest to get the spindle encoder working is via stepconf. Remember that stepconf overwrites any changes you have made directly to your hal and ini files. I create a new config so I can use stepconf to set pins and use the in built encoder setup steps. Just follow through the wizard. Select the inputs you have for index and phase a (if you are using a quadrature encoder I believe you'll have a phase B also). Remember to generate a custom panel so that you can actually see the spindle readout. Once you've gone through the wizard you'll need to copy the relevant parts from the new hal file to your hal file. # add the encoder to HAL and attach it to threads. # set the HAL encoder to 60 pulses per revolution. # set the HAL encoder to non-quadrature simple counting using A only. # connect the HAL encoder outputs to LinuxCNC. # connect the HAL encoder inputs to the real encoder. # **** ACTUAL velocity is in RPS not RPM so we scale it.